An Advanced Novel Drug Delivery System. 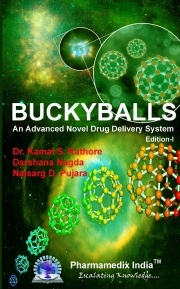 The main aim of writing this book was to introduce a new and advanced novel drug delivery system called buckyballs. Buckyball is a member of a class of carbon structures called fullerenes. Hence they are also known as Buckminsterfullerene or fullerene. This book includes introduction, classification, properties, synthesis, advantages, disadvantages, application and different experimental work done on buckyballs. The authors are acknowledging to all the contributors for their tremendous support and encouragement throughout the publication of this work. The authors are also thankful to the Department of Pharmaceutics, Bhupal Nobles' Institute of Pharmaceutical Sciences for providing the necessary resources for publishing this novel work into a book. Bhupal Noble’s Institute of Pharmaceutical Sciences.